NY Times: Summer Breezes In, Sipping Barbera. Two of my favorite Italian reds, barbera and dolcetto, are mentioned in this article and barberas are reviewed. iTunes Plus, the DRM-free version of the iTunes Store, launched yesterday with kind of a big bang—Paul McCartney’s full catalog. The promised Upgrade My Music feature launched too. I didn’t really know what to expect there, so I was kind of astonished to see that the list of my purchases that were eligible for upgrade included twelve albums worth of music. I decided to go ahead and make the move to the high resolution downloads. Now I’m kind of wishing I hadn’t—or at least that I had waited until a few days after the service launched. That’s a lot of 10 MB downloads, and they have a tendency of taking a really long time. Three of the downloads stalled the entire queue last night, so it looks like I will have to babysit the downloads for a few days. Fortunately restarting iTunes appears to have cleared whatever blockage was causing the problem. One interesting unanticipated feature of the upgrade was spotlighted by CNet, who point out that the upgrade feature provides a way to retrieve a previously purchased but lost song for only 30 cents. BBC: Music site Last.fm bought by CBS. That’ll buy a whole lotta servers. It also puts CBS in an interesting position to mine data about listening habits—interesting, because CBS also relaunched CBS Records last year. Maybe they can do a better job than the current crop of majors at dealing with the realities of the music market. I enjoy Last.fm but I wish their plug-in for iTunes did a better job of reporting playback data from my iPod, which is now my predominant form of listening. If you look at my profile page you’d think that I only listened to classical music last week, but that’s far from true—that’s only what I listened to at home over iTunes. Today marks the 10th anniversary of the disappearance of Jeff Buckley into the Mississippi River, and into legend. At the time, the death of the 30-year-old singer felt like a body blow, and ten years haven’t dulled the impact; if anything, the feeling of cosmic unfairness has deepened over the years. 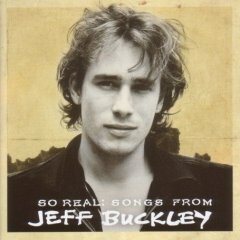 So the new anthology So Real: Songs from Jeff Buckley comes at a time where many of us were pondering Jeff’s legacy anyway, and it is that rarest of things, a greatest hits that illuminates and surprises rather than simply summing up. There is no way that I can write a review that does justice to this in a linear way; there are too many connections striving to be made. I will include these as asides throughout the review. The compilers of the collection, Mary Guibert (Jeff’s mother) and Tom Burleigh, had a challenge: How do you do a greatest hits album for an artist who only had one album before his untimely death? They chose an unconventional path: include half the debut album, Grace, together with selected b-sides, studio work released posthumously, and released and unreleased live recordings. It could have sounded like a shambles; it’s a testament to Jeff’s artistic brilliance and consistency that it sounds like a coherent whole. In one form or another, eight of the ten songs that formed Grace are on this disc, four in their studio version (“Last Goodbye,” “Lover, You Should’ve Come Over,” “Grace,” “Hallelujah”). The compilers chose alternate versions (that previously appeared on the Grace Legacy Edition of a few years ago) for “Eternal Life” and “Dream Brother,” a live version of “So Real” that was previously only available on a promo single, and the hypnotic version of “Mojo Pin” from Live at Sin-É. From Buckley’s posthumous Sketches for My Sweetheart, the Drunk, we get “The Sky is a Landfill” and the sultry “Everybody Here Wants You,” and the driving “Vancouver.” The delicate “Je N’en Connais Pas La Fin” (also from Sin-É) also appears as a bridge to the closing three songs. The remaining two songs are where this collection sets itself apart from a “greatest hits” mentality into the realm of the fan compilation. “Forget Her,” a Grace-era b-side that also appeared on the Legacy Edition, has long been one of my favorite Jeff Buckley songs. A straight-driving impassioned blues with little of the Middle Eastern meets Zeppelin flavor of his debut, it has the dual distinction of being more singable and more direct than most of his early output, presaging the slow jam of “Everybody Here Wants You” and other late tracks. The final track, a never-before-heard live performance of the Smiths’ “I Know It’s Over,” wraps the compilation in the mystery of Jeff Buckley’s passing, what Mike Doughty calls in the liner notes his “effortless ability to become a myth, a legend.” Where the Mystery White Boy live recording included “I Know It’s Over” in medley with “Hallelujah,” here that striking first lyric, the finest line that Morrissey ever wrote for Jeff Buckley, stands on its own and makes you catch your breath with the unfairness of it. Because the rest of the collection is a testament to his brilliance and range as an artist, performer, and songwriter, the ending hurts all the more ten years on. At least we have more to remember him by now than we did then. Buckley fans are nothing if not opinionated. So Real comes close to meeting my high standards for a single-disc compilation, though there are a few changes I’d make–as a fan, I’ll always want more rarities. What would your greatest hits of Jeff Buckley look like? I posted a whole bunch of photos to Flickr last night from this weekend’s trip to Richmond to see Esta graduate. Many many things at which to marvel, including a sea of academic regalia, some pretty great party faces, Richmond’s very own Art Deco movie theatre and SR-71 reconnaissance plane, and others. I also posted some foliage shots. 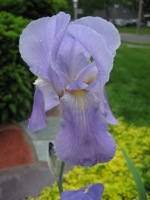 The iris bulbs that my dad sent me from my grandmother’s garden in North Carolina finally produced flowers this year, and they are extraordinary. I spent much of the morning and afternoon yesterday putting down mulch in our flower beds and it was nice to be out in nature again. It was also nice to contemplate a reduction in weeds. We’ve stayed away from mulch after our experiences in Kirkland, where the weeds seemed to be able to grow in anything thanks to all the rain, but last summer’s barrage of uninvited guests convinced me to give the mechanical strategy of protecting the soil another try. At Art of the Mix, a new one somewhat in honor of my sister’s graduation this weekend from seminary: empty as a pocket with nothing to lose. Somewhat in honor because it didn’t start out that way, but between the gospel and devotional music in the first half and the general promise at the end it seems like a good fit. Congrats, sis. Next week is shaping up to be interesting for those of us in the Boston area who care about the direction of the Internet. First, there’s the O’Reilly Ignite session (an evening of networking, speakers, five-minute elevator pitches, and more). Then the next day, the Berkman Center hosts the 2007 Internet and Society Conference, on the topic of how universities stay relevant in the face of the erosion of traditional, hierarchical ways of structuring and mediating knowledge. Berkman fellow David Weinberger, whose Everything is Miscellaneous I just completed reading in the airport Legal Seafoods, should have some interesting things to say about the topic. Nice to see, too, that some other familiar faces, including Doc Searls, Dan Gillmor, and Jessamyn West, will be in attendance. Gee, if I didn’t have to ship a product at the end of June, I’d be taking some serious vacation time next week. In other words, the administration is using one of the most politically hot positions in the justice department as a way to repay political favors. And I do mean repay: an annual salary of $113,904 is nothing to sneeze at. Is it any wonder that the cries for impeachment of Attorney General Alberto Gonzales are crescendoing? The quietest flying day of the year? It is Friday evening on Memorial Day Weekend. I have the honor of flying to Richmond tonight so that I can attend my sister’s graduation tomorrow as ambassador from the Boston Jarretts. I am excited and happy for her, but at the same time I’m puzzled. Why? Because I’m sitting in an empty airport, that’s why. The road was virtually empty as Lisa drove me into Logan tonight; the airport is almost empty. Granted, I have a flight that leaves at 8:45 PM on Friday night, which might as well be midnight by airline standards, but still. Might the best time to travel on Memorial Day weekend be … Friday night? Househack of the day: Sliding bookcase-door Ikea style, courtesy Ikea Hacker, complete with part numbers and instructions. Dirk Gently fan podcast, in memory of the late great Douglas Adams. And of course, LOLPresidents. Oh dear. Bebel Gilberto, whose music hovers the blurred boundaries between bossa nova, salsa, and trance music, has come a long way from her first album. Tanto Tempo came out of nowhere to establish Gilberto as a fresh voice in the global musical culture, with its catchy blend of traditional Brazilian sounds and global dance music. The subsequent remix album positioned her within the electronica tradition alongside such vocal muses as Beth Orton. Subsequent albums, though, have backed away from that dance focus somewhat. The second, self-titled album, was less cool and perhaps more approachable, with greater focus on songcraft and more memorable songs. The third album, Momento, continues to seek a different path. At the end it finds, not masterpiece territory, but a very pleasant place to relax for a while. My perspective on Momento is summed up rather neatly by a positive Amazon review of the album, which begins, “I discovered Bebel’s music at the coffee shop…” For background mood music, the album is darn near perfect: impeccably produced, constantly keeping dynamics and tempi just under the liminal threshold. But if you’re looking for something world-changing, move along; this is no Radiohead album. Instead, it’s music for a pleasant afternoon. Which, frankly, there is not enough of in the world at present. I find it difficult to disengage my critical faculties even when an album is so precisely targeted, though, so I must share the bad news: Bebel’s performance is not so much cool as sleepy. On her self-titled second album there were moments alternately playful (“Baby”) and dramatic (“Aganju”) that showcased the interpretive range of her vocal instrument. Only “Caçada” steps above an emotional mezzoforte, and that largely on the strength of the superb backing band. The other performances are pleasant enough, but curiously affectless. Where an artist like Sadé might build a career out of flat vocals, it is frustrating coming from Bebel. Thanks to her superb first two albums, we know she can give more. Here’s hoping that she digs a little deeper next time around and gives us a release that is not just pleasant, but essential. Some very good news for the good guys today. Watertown blogger Lisa Williams was among several local bloggers who won a NewsChallenge grant today. The grants are being given in honor of “ideas and projects that will transform community news”; certainly H2OTown qualifies, as does Ethan Zuckerman for his work on Global Voices (thanks to Universal Hub and Doc Searls for pointing me in their direction). Another mazel to Feedburner, who is being purchased by the omnivorous Google for $100 million. Guess that says one of two things: there is real money to be made in advertising in RSS feeds, or there’s a buying war on in the online advertising inventory market. New York Times: How to Make Your Cellphone Act Like a BlackBerry. David Pogue discusses three options for doing email on a regular cell phone: Google, Yahoo, and Teleflip. Who? I first linked to Teleflip almost two years ago, in the context of their still-free universal email-to-SMS gateway (now rebranded as FlipOut). The new service, FlipMail, apparently will allow checking any email account from the phone as SMS messages, provided you’re ok with reading only the first 120 characters, and eventually with seeing ads. But there should be a lot of people for whom this will beat investing in a smartphone so that they can run the Gmail Mobile client or Yahoo Go, and Teleflip stands to make some revenue from the ad stream, which will be nice for them. Pogue misses the point, too, about the Gmail and Yahoo offerings. They are almost certainly intended first for preloading on smartphones, second as downloads for power users. I don’t think he made too many friends that way. But there’s something about office kitchens that brings this tendency out in people. Each individual likely is in the kitchen by himself and thinks of it as his or her own domain; when a reminder (in varying degrees of rudeness) comes that it is in fact a shared space, the individual can lash out in some surprisingly ugly ways. The office kitchen, in short, is a lot like an Internet forum.